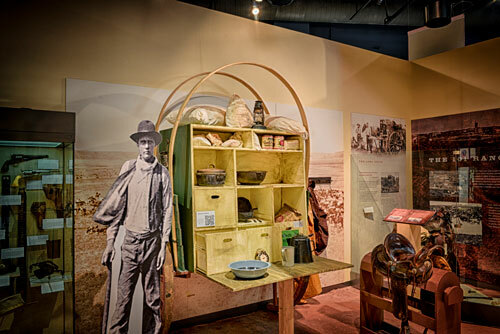 The Sam Noble Gallery illustrates Oklahoma’s early history, including its settlement and development as a state. 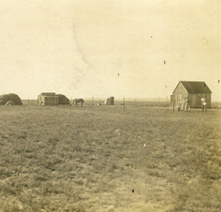 Through artifacts, images, and firsthand accounts of participants, visitors can relive the experiences of those brave souls who settled our plains and turned homesteads into farms and cities. It was their survival of and adaptation to the extremes of weather, economics, and politics that enabled them to create this magnificent state. Topics covered include land runs, education, the Oklahoma Centennial Farm & Ranch program, urban development, law and order, pioneer life, cowboys, and the Oklahoma Century Chest. There is also a replica of a sod house, a 1930s-era house, and a 1950s pink kitchen. 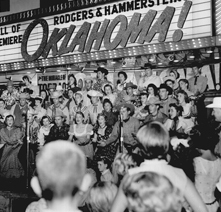 The Oklahoma History Center’s exhibit, Rodgers & Hammerstein’s Oklahoma! : The Birth of Modern Musical Theatre and a New Image for the State celebrates the 75th anniversary of the Broadway production’s debut. Based on the 1931 play Green Grow the Lilacs by Claremore native Lynn Riggs, Oklahoma! was the first musical written by the legendary team of Richard Rodgers and Oscar Hammerstein II. 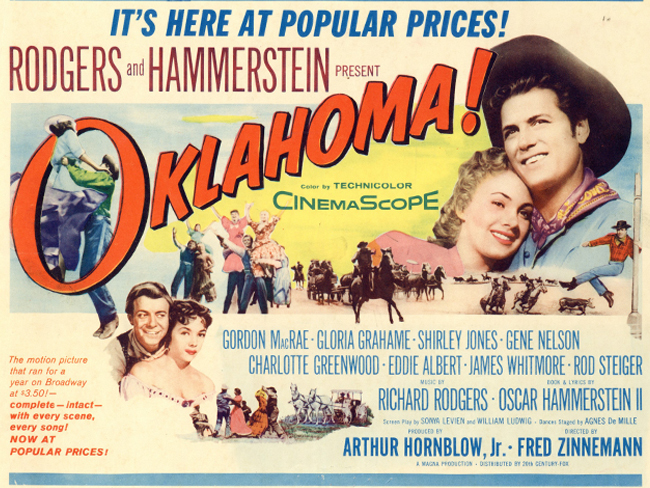 Rodgers and Hammerstein’s Oklahoma! began a new era in American musical theatre. It also began the most successful songwriting partnership that Broadway has ever seen. Oklahoma! premiered on Broadway at the St. James Theatre on March 31, 1943, and closed after 2,212 performances. Set in Indian Territory just after the turn of the twentieth century, the spirited rivalry between the local farmers and cowboys provides the backdrop for the love story between Curly, a handsome cowboy, and Laurey, a beautiful farm girl. The title of the History Center exhibit makes reference to a “New Image for the State.” In 1939 John Steinbeck published his Pulitzer Prize-winning novel The Grapes of Wrath, a fictional account of the mass migration of thousands of “Okies” from Oklahoma to California in search of jobs, land, dignity and a future in the shadow of the Great Depression. The novel cast an image of hopelessness, bank foreclosures and economic hardship on Oklahoma. Rodgers and Hammerstein’s Oklahoma! counteracted this image with its lively musical comedy that, despite a few fight scenes that include an accidental death, portrayed romance, laughter and a spirit of joy in direct contrast to the storyline of The Grapes of Wrath. 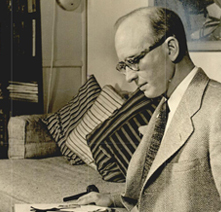 Visit the Oklahoma Historical Society on Google Arts & Culture to learn about playwright Lynn Riggs, the early history of the state, and the lasting impact of the musical Oklahoma! The Oklahoma Century Chest time capsule was buried on April 22, 1913, in the basement of the First Lutheran Church of Oklahoma City. One hundred years later, on April 22, 2013, the church opened the chest and revealed the perfectly preserved contents deposited by the pioneers of Oklahoma. Visitors can view photographs, documents, and artifacts from the chest. The exhibit also includes a poster promoting the first Fourth of July celebration in Oklahoma City on July 4, 1889; a letter to the blind of 2013 written in braille; the first state flag of Oklahoma, and much more. In addition, the exhibit contains dozens of messages, prophecies, and letters from the pioneers of 1913 to their descendants one hundred years later. View letters, photos, and more online at okhistory.org/centurychest. 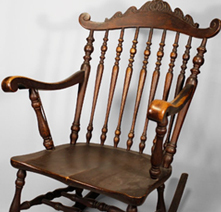 Curators’ Corner is a special area that highlights recent museum donations and artifacts specially chosen by the curators for the interesting stories each item tells. The conserved mural Trail of Tears, painted by Elizabeth Janes in 1939, is a long-term feature. Also included is information about the profession of art and artifact conservation, and examples of objects from the museum’s collections that could benefit from the work of a conservator. The artifacts in Curators’ Corner rotate approximately every six months.